Honouring mothers and fathers means being grateful for the gift of life and Christians should never insult anyone’s parents, Pope Francis said. “Among us there is also the habit of saying awful things, even profanity. Please, never, never, never insult other people’s parents. Never! 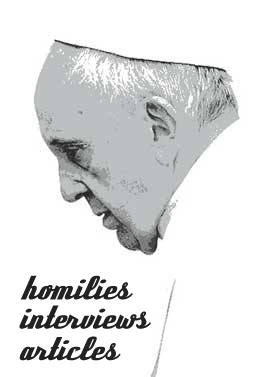 Never insult a mother, never insult a father,” the pope said during his weekly general audience. “Make this decision: from today forward, ‘I will never insult someone’s mom or dad.’ They gave life! They should not be insulted,” he told those gathered in St. Peter’s Square. Gray clouds forming above the square did little to dampen the spirits of thousands of pilgrims who cheered as they waited for the pope to pass by in his popemobile. As customary, the pope greeted them, blessed religious articles and kissed children who were brought up to him. “Honour your parents: they gave us life. If you have distanced yourself from your parents, make an effort and return, go back to them, perhaps they are old. They gave you life,” the pope said. Pope Francis explained that the promise of a long life that comes from honouring one’s parents associates happiness with one’s relationship with them. “This centuries-old wisdom declares what human science has only been able to elaborate upon a little over a century ago: that the imprint of childhood marks a person’s life,” he said. Recalling the life of Blessed Nunzio Sulprizio, who will be canonised alongside Blesseds Paul VI and Oscar Romero Oct. 14, the pope said that although Blessed Sulprizio lost his mother and father when he was very young, he “reconciled with so much pain” and never betrayed his parents. “We should also think of St. Camillus de Lellis, who, out of a dysfunctional childhood, built a life of love and service; St. Josephine Bakhita, who grew up in horrible slavery; or Blessed Carlo Gnocchi, orphaned and poor; and even St. John Paul II, who was impacted by the death of his mother at a tender age,” he added.